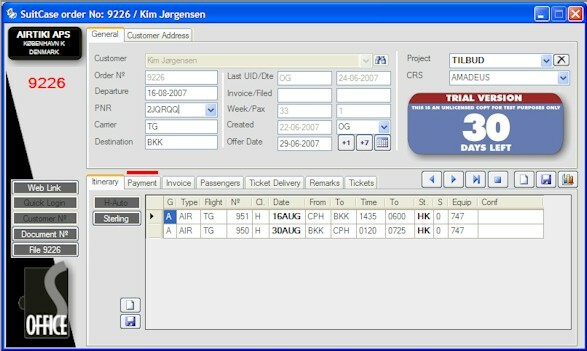 Soft SoftSuitCase has been designed to receive reservation information from a Front- Office System, such as an Online Booking System and/or any CRS like Amadeus, Galileo, Sabre and WorldSpan. 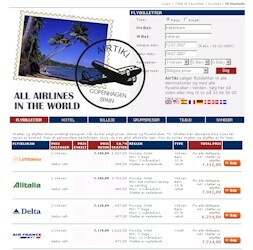 The reservations made, are transmitted from the Online Booking System or CRS to SuitCase and are presented as Orders. Each Order is associated with a Customer or purchaser, who may or not be one of the passengers in the reservation. Customer Information is stored in a database, for future reference, promotional mailings and purchases. An Order has all the information sent by the Online Booking System or CRS like the PNR or multiple PNR’s, passenger names, flight segments, etc. SuitCase for Amadeus was specifically designed to receive Online Bookings from most CRS (Central Reservation Systems) like Amadeus, Apollo (Galileo), Sabre and WorldSpan. The reservations made, are transmitted from the Online Booking System or CRS to SuitCase 2007 and are presented as Orders.